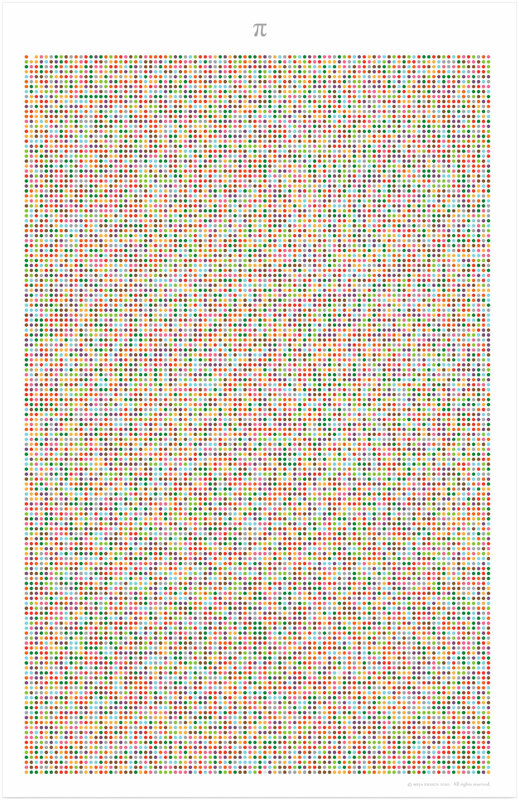 A visualization of Pi to 13,628 places. This is a visualization of Pi to 13,628 places. Like the Voyager Golden Record of 1977, I was interested in communicating a concept without alphanumeric characters. Pi is a universal concept, true in any language any place in the universe. By following the color coded system of dots for each of the 10 numerals, any individual could read this small portion of pi. Fun fact: If you look closely you can find the Feynman Point which is a series of six 9’s that Richard Feynman said he wanted to be able to memorize up to. He said he would want to recite to this point and quip “nine nine nine nine nine nine and so on.” Hint: 9 = dark green.